Melanie Gaylord (@Melanie_Gaylord) – Blog http://melaniegaylord.com – be sure to check out her Twitter and Blog! Last week I asked the Pros what Recruitment means to them and how did they get into recruiting. This week, I think it’s important to let the Newbies understand what could happen in the day of a Recruiting Pro. 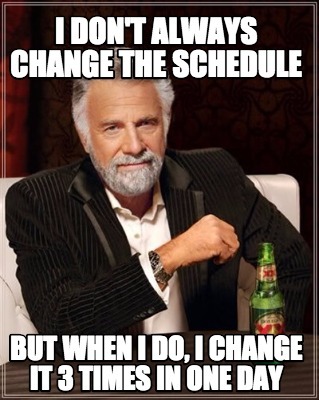 I say could because as we all know in HR, anything can happen and change your schedule. Keith is currently in charge of both an HR team and Training team of 9 that focus on senior leadership recruitment. He makes the point that there isn’t a big turnover (lucky him!) in that area for their company, so he will occasionally go back to the retail level of recruitment. In HR there is always something to learn, but going back to the basics and keeping the skills that you already know intact and sharp, is very important. We can’t forget what we knew just to learn a new skill. HR has a lot of areas, as you will find out in this series. I’m constantly researching webinars, local chapter sessions, anything that will help me learn the new, but also remember the old. Wendy currently works for a university and is in charge of the facilities & service department. Her range of recruitment is wide, “We recruit for positions including engineer, project manager, skilled trades (HVAC, electric, plumbing) and unskilled trades (custodial, mail, inventory) jobs”. Wendy is able to focus on writing job descriptions, ensuring market & internal equity, with the department heads, and leave the day to day work with her assistant. Being able to divide and concur with a trusted employee is often the make or break for some HR departments. My boss and I have the same setup, and she also allows me to be apart of her everyday work to help me learn more about the field. Cici works for about 145 different companies that are seeking veterans. She can be found doing a lot of different things like coaching job seekers to help them land the perfect position. Reviewing job descriptions, creating an ideal profile in her head and going out to find the perfect person. As a recruiter it’s important to trust your instinct on a candidate and help them achieve their goal, as well as meeting company needs. Veterans have many skills they learned in the Military that can be transferred to office skill sets and leadership. Always remember, just because someone hasn’t been wearing a suit and clocking in and out for the past 5 years of their life, it does not mean they don’t have the skill and ability to lead! Melanie gave a great response for a questions from last week. 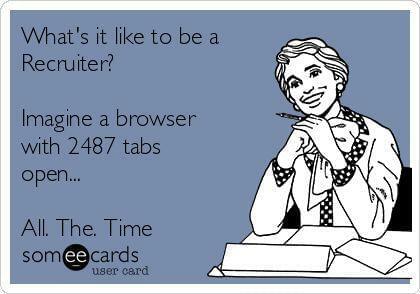 “Recruitment can be a burn out job. It requires constant communication via both phone and email.” In any area of HR you are going to need to put yourself out in the open. We can’t all be Toby’s, letting people get away with anything, because the manager doesn’t like us. According to most business leaders, no one likes HR, but in reality, HR ROCKS! We aren’t in HR to be the “fun police” and stop our companies from achieving the very best. If you’re only thinking about getting in this field to yell at someone, tell them what’s wrong with them, doesn’t believe in encouraging and helping self promotion within a person, please do NOT get into Human Resources. Recruitment is probably the best field to enter the HR world and get much experience in multiple areas. All of the HR pros that took the time to answer my questions are helpful, knowledgeable, and more qualified than I am to tell you more about exactly what Recruitment is in the HR world. Reach out to them, read the blogs they are writing, the tweets that they send out, the conversations they have. Thanks for coming to find out how you can recruit like a pro. What job should I research next? Comment below or hit me up on any of my social media accounts! Next Post #FF – Just Keep Swimming. Thanks for sharing this! My question to recruiters, how much of your time is spent sourcing, and how much do you spend on the other parts (job descriptions, onboarding, etc. )?